Bees have been disappearing from the planet at an alarming rate, a phenomenon that seriously threatens our ecosystem. 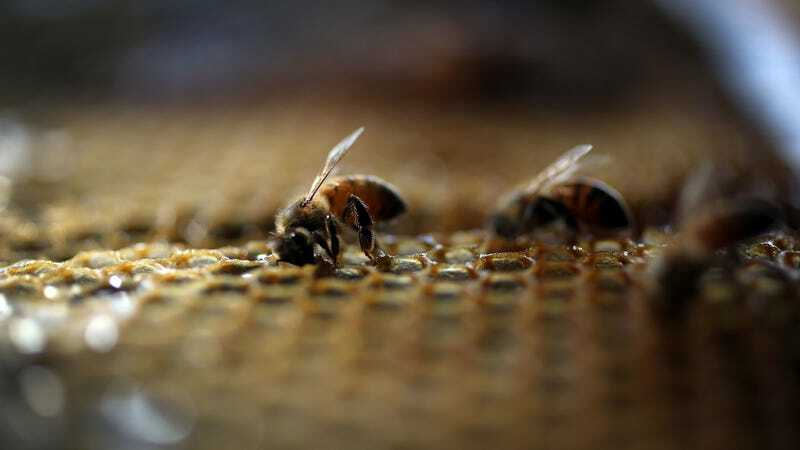 Scientists speculate bees are dying out for a number of reasons, including pesticides, habitat losses, starvation, and parasites. What they have not considered, however, is that bees have just decided to make their homes inside human body parts, where they are free to suckle our body fluids as they please. Such is the message I have gleaned from the following news story, per KRON 4: a 29-year-old Taiwanese woman named He was found to have four bees embedded in her eye and feasting on her tears. Doesn’t that sound nice? He confirmed she was at a family member’s grave pulling out weeds when she felt as if she got dirt into her eye and flushed it out with water. “I saw something that looked like insect legs, so I pulled them out under a microscope slowly, and one at a time without damaging their bodies,” Dr. Hung said. The bees in question were sweat bees, according to the report, and they survived inside He’s eye by feeding off the tear ducts under her eyelids. Both the bees and He appear to have survived the ordeal. Now, some people might think this particular news item was plucked straight from the depths of hell, but I think it’s a nice story about the ability to adapt to one’s environment. Anyway, are we sure the bees are actually dying off, and not simply hiding in our eyeballs? Have you checked your eyeball? Doesn’t your eye itch just a little? Go ahead. Check your eyeball. I’ll wait.